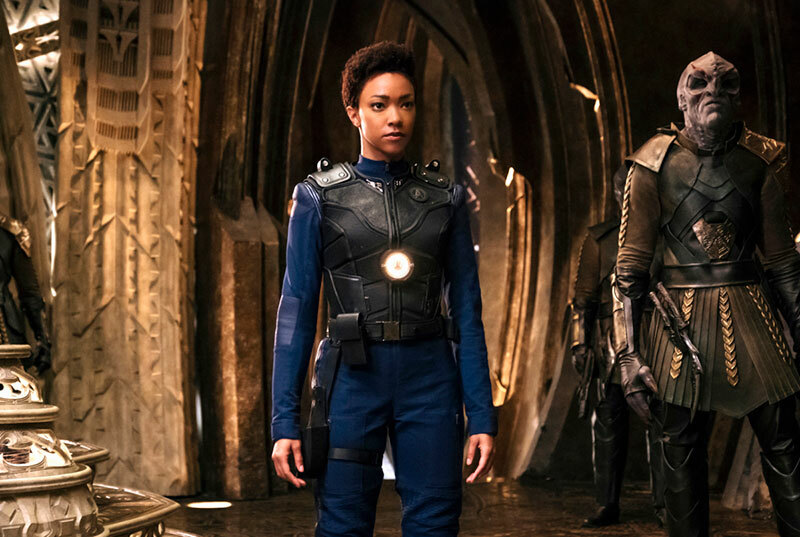 Star Trek: Discovery‘s mid-season finale “Into the Forest I Go” managed to deliver substantial character moments – as seems to be the show’s forte – all amid a fast-paced episode that seemed at times more like an actual season finale rather than a mid-season break. There were quite a few standout moments in this episode, including key scenes from Ash Tyler, Captain Lorca, Lt. Stamets, Doctor Culber, Michael Burnham, and of course, the Discovery herself. Let’s get into it. Let’s hit the artistic moments in the episode first. “Into the Forest I Go” is a gorgeous episode. The establishing shot of Discovery in orbit around Pahvo is certainly desktop wallpaper-worthy, and the subsequent battle scenes are visually on par with what we saw in the “Battle at the Binary Stars.” If Discovery hadn’t already proved it was a looker, this episode sealed the deal. The same noteworthy imagery was seen in the final conversation between Lorca and Stamets at the end of the episode, as the two looked out at Pahvo and its setting sun. It’s really pretty stuff. But these observations are only surface-level comments. As it turns out, “Into the Forest I Go” contained some meaty character beats. Perhaps most intriguing is Ash Tyler’s acute struggle with PTSD as he confronts L’Rell (a scene which also seems to disprove the theory that Tyler is actually a disguised Voq). The flashback scenes of Tyler’s physical (and later in the episode, sexual) torture were appropriately disorientating and disconcerting, and really spotlighted Shazad Latif’s ability to emote a tortured psyche. Discovery certainly earned its mature rating here. This illumination of his time on L’Rell’s ship was welcomed, as we had only a vague idea of Tyler’s suffering. This PTSD plot point brought powerful character moments for two others, as well: Admiral Cornwall and Burham. Cornwell was able to showcase her psychological skills as she attempted to remedy Tyler’s incapacitating shock on the Sarcophagus, and later in the episode, Burham showed her emotional development as she comforted Tyler back on Discovery. It looks like Tyler’s struggle isn’t over, though, as we get a tease that his relationship with L’Rell, now a prisoner-of-war on Discovery, is more complicated than it seems. Then we have Stamets and his struggle to survive the ordeal of repeatedly jumping Discovery in its fight with the Klingon ship. Obviously, the spore drive has taken a toll on him, and both Anthony Rapp and Wilson Cruz take the spotlight in their characters’ shared physical and emotional stress. Their relationship has only briefly been explored, and it was nice to see the two men combat adversary together. As we see at the end of the episode and in the tease for the return episode, it seems Stamets is dramatically altered through that one last spore drive jump. It will be interesting to see how the couple’s relationship continues amid such strain. 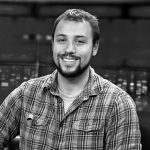 The real question: where is Discovery now? 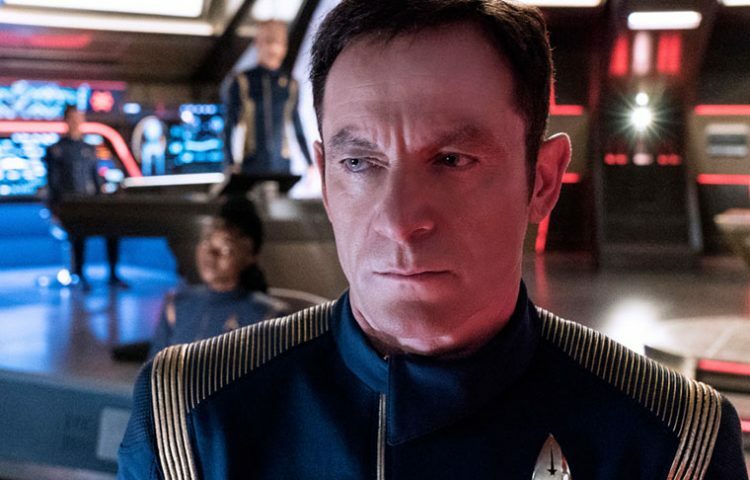 Based on the foreshadowing conversation between Stamets and Lorca about the drive’s ability to see into parallel universes, logic would suggest Discovery has indeed wandered into much-teased Mirror Universe. And if you’ll notice, the starship wreckage we see at the end of the episode contains red markings, a common design in previously seen Mirror Universe Federation ships. 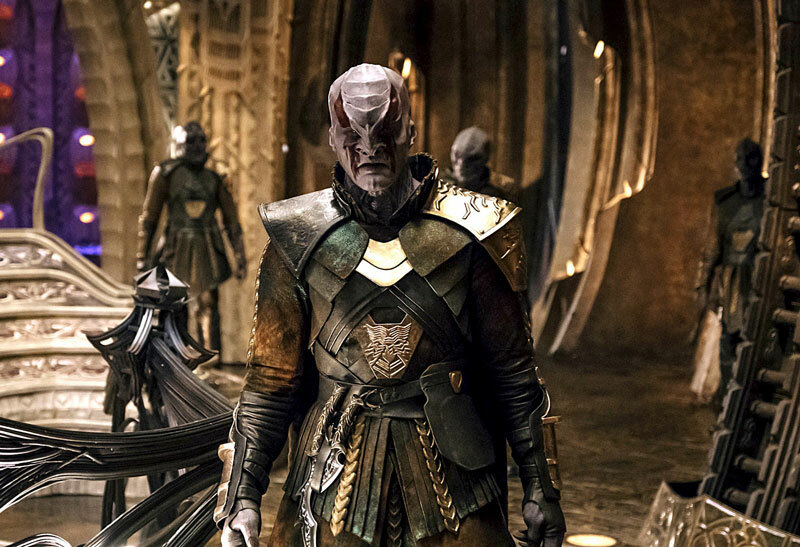 Perhaps they’ve jumped into a universe where the Klingon War has gone dramatically differently (which might provide a chance to bring back certain deceased characters…?). Taken together, “Into the Forest I Go” contributed greatly to Discovery‘s ongoing superb character development while providing a fantastic battle sequence, beautiful imagery, and an intriguing mid-season cliffhanger. As noted by Lorca (of all people), the post-war spore drive has the ability to really open the floodgates to exploration, a theme that the second half of the first season will undoubtedly showcase. 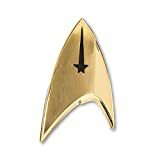 And lastly, we can’t forget to mention the full-circle nature of Burham now having her former captain’s Starfleet insignia, stolen from Kol in their melee. While this symbolism is perhaps too on-the-nose, the emotional effect is still potent. We see the view from the bridge when Discovery jumps to warp. A cool effect for sure. … As is the beautiful shots of Discovery facing off against the Sarcophagus. Discovery has the ability to activate the spore drive while in regular warp. Fancy stuff. The choice to have Burnham use the universal translator, thus allowing the Klingons to speak English, was a great choice. The climatic fight between Burham and Kol would have seriously been hampered by subtitles. 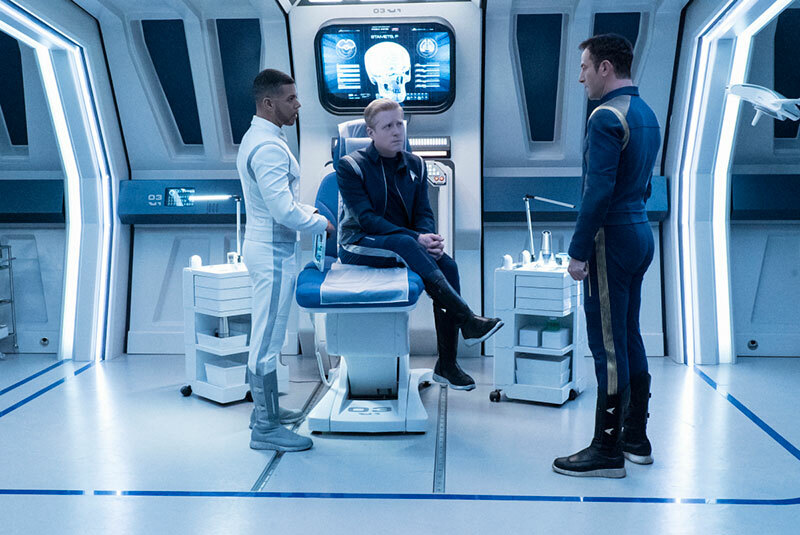 Discovery is set to return on January 7 for six more episodes. The season finale will air on February 11. What do you think we’ll see in the return episode? Let us know in the comments!